It is believed that at least 2,000 years before Christ, the pre-historic Calusa Indians inhabited this remote island. Evidence of their existence was first discovered in 1895 when Captain Bill Collier, son ofMarco's founder, W.T. Collier, was digging on his property (known then as Key Marco). Today, this area is called Old Marco and was the site of one of the most successful archaeological digs in North America. 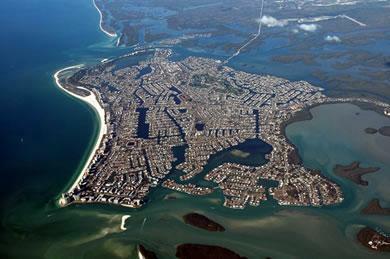 Marco Island is the largest of the Ten Thousand Islands, measuring 24 square miles. Due to the influence of the Calusa Indians and their "shell mounding", the highest elevation in S.W.Florida is right here onMarco, at Indian Hill, which is 51 feet above sea level.